General Costume/Attire: Mostly casual teen attire, some trendy teen attire. See more here. ​Synopsis: Mancy Crew is a senior at River Peak High School. With a natural talent for investigation, she founded the River Peak High Forensic Science Club, which has even assisted the police department on occasion! 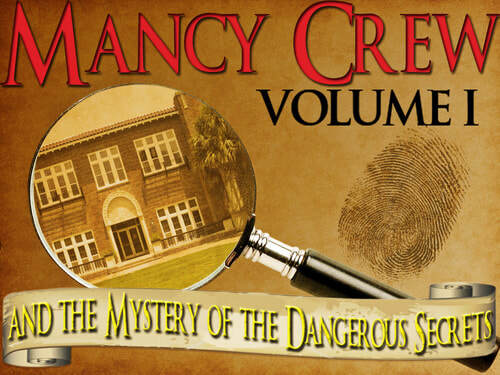 ​Mancy has asked the forensic club to assemble in the teacher’s lounge of River Peak High. She will give the group details about the anonymous tip, but she also has a few stress-relieving games planned to break up the meeting. As Mancy says - relaxed sleuths are effective investigators! Rumor has it there are codes to break and riddles to solve before the hidden secret can be found somewhere in the school. Also, the anonymous tipper has hinted that someone in the forensic club may be a member of the Sisterhood of the Dangerous Secrets! The group will need to rally together to find the secret and find the member of the Sisterhood! General Costume/Attire: Coloured clothing to match your bug character. Find more details here. ​Synopsis: The mischievous cockroaches from La Cookaroacha overpopulated their town once again and needed to expand their borders. Unfortunately, the roaches chose Bug City as their next location! The wicked roaches sneaked into Bug City and hid the bug's honey in a secret location. The cockroaches knew that the only thing protecting Bug City from being flattened by the bears of Big Bear Forest was the honey in the honey combs surrounding the city as this feeds the hungry bears! Without the Bug City honey, the bears would trample over Bug City while searching for something else to eat! Looking to do a certain theme or something else then what you see here? Ask us. We may be able to help.